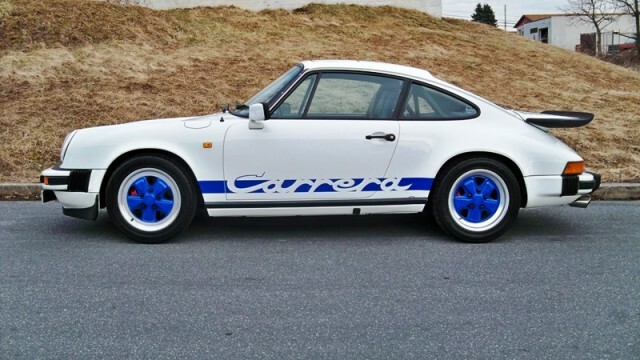 1979 911SC Euro » Specialty Cars Service Center, Inc.
New and complete paint work performed 01/11 in colors Grand Prix White with Mexico Blue painted Fuchs wheels and Carrera body graphics. Interior black vinyl with factory sport seats, 4 point bolt in roll bar. Engine: 1981 911SC with 36,000 miles and fully serviced. Trans: 915 fully rebuilt with new Sachs power clutch kit. Exhaust: SSI heater boxes with a B&B Stainless Sport Muffler.